Because it's been a while since I gave away some of my creations, and because I so love my followers, I put together a little heavenly vignette for you. Christmas is just around the corner, and I'm very busy working on pieces just like this for my show, and shop. While doing so, I thought I'd share a few. Consider this an early gift from me to you. This giveaway includes three of my angel wing bottles, an Italian rosary, and one of my large clay angel wing tags. 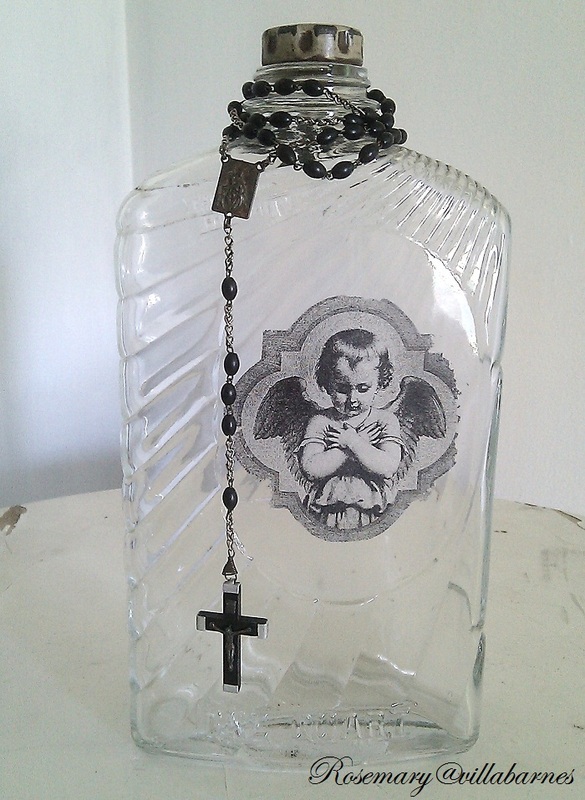 This bottle is 10 inches tall, has great detail, it's original cap, and has been wrapped at the neck with an Italian rosary. I applied one of my favorite angel images to each bottle. I'm including one of my large angel wing tags. 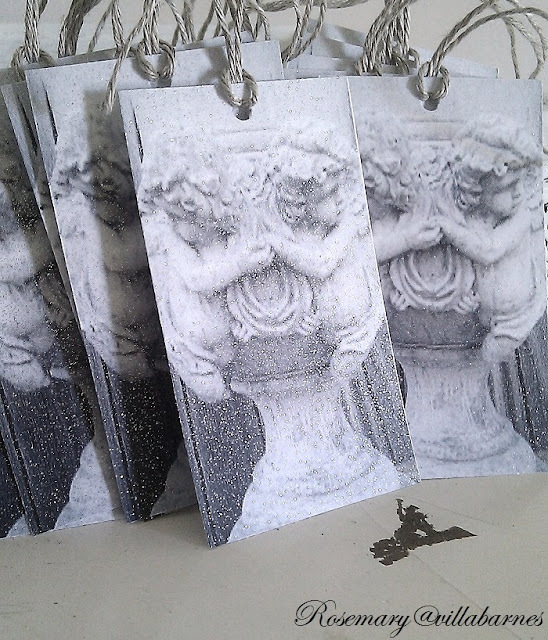 Oh wait, let's throw in 10 cherub tags. Recognize these guys? I gave them a spritz of glitter. Dress up some presents, use as bookmarks, or give a few as gifts if you like. The winner will receive all of the above. I am a follower on linky too! I'm already a Linky follower too. Shared your giveaway on my facebook page. Very nice Rosemary. Please include me in your giveaway. I am a follower on google blog for some time now. I am a new email and twitter follower!! I just love your giveaway and your blog! I've been following you for sometime. I have you as one of my favorite blogs on my blog page. I check your blog daily for new posts. Love all your creations!! I would love to win some of your bottles. They are to die for. Thanks for the opportunity to enter. I so admire your energy!! I am now your newest follower on Linky!! A sweet giveaway Rosemary. Please enter me too. I'd love to win! It would be nice to be chosen angelically. I am a long time observer, a very long time. You always create the most beautiful things and these bottles and tags are stunning. Would love to have those beautiful gifts! Love the angel wings especially! What a lovely vignette! I hope you can ship to Canada, lol! Beautiful creations as usual.. I am a follower and would love to be entered.. Thanks! Love love love these. I am a follower as well. Oh yes I follow you with gfc and would love to win! Rosemary, I'd love to win your fabulous creations. please enter me! Just shared on my blog. Rosemary, your bottles and tags are gorgeous. I would love the chance to win! I am so excited about this opportunity to win some of your beautiful creations. Everything is gorgeous as usual. I just received the little angel wings ordered on Etsy. give away, you are so generous!!!! Love your blog and have been a follower for quite some time! You are both very talented and generous in sharing your talent! I'd love to win these beautiful gifts but mostly find your blog to be a gift! I've been a follower for a while enjoying your blog for some time! You do some beautiful items, please enter me in the drawing. Thank you. Hi Rosemary, Thanks for the giveaway. I'm a follower via email. Oh, what a generous giveaway! I would love to win one of your gorgeous creations! Thank you for the opportunity! Oh how beautiful! I would love to win this wonderful giveaway. I am a follower of your blog. I would love to grace my home with your beauty in all things you create, and of course my daughter would love one of your bottles added to her sweet collection on her chest of drawers. Thank you for your beautiful visit and comments that I cherish. Rosemary, I am a long time follower of your site and all you inspire. Rosemary, I have long lusted after your heavenly goods. Beautiful, wonderful thingies. 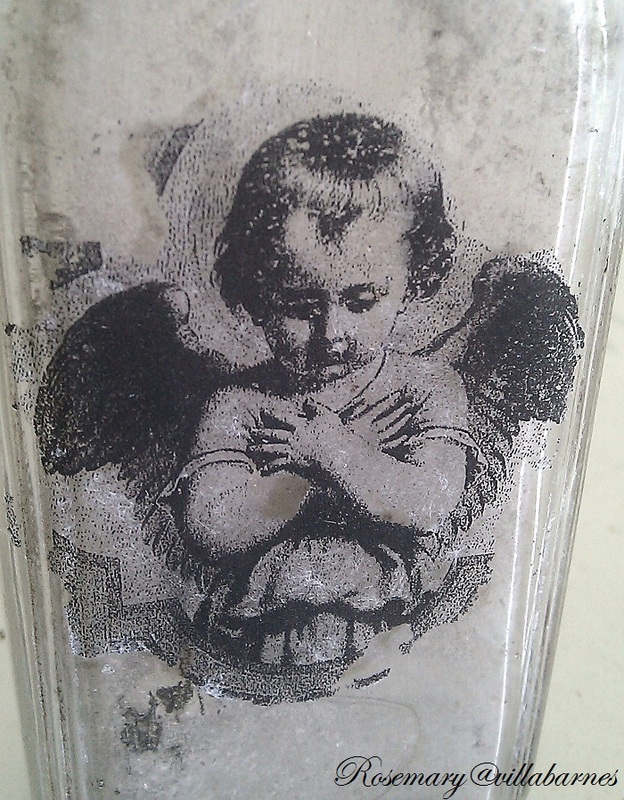 I have found myself drawn to all things cherubs, angels, and crosses. For this reason, I would love to win your giveaway ! What a generous offer to all of your fans ! I have been a follower for awhile and love seeing every thing you bring to us ! i love your offerings and am a follower!!! i'm a linky follower too!!! also i've purchased a few of your items...an old cherub clay wall mount (that is above the sink in my bathroom) and a old table piece redo with 2 knobs. love your creations!! Hey, how are you? Looks like you've been busy:-) Thanks for the chance to win some of your beauties! Such a beautiful and generous giveaway! I would LOVE to be considered and yes, I'm a follower. My dear friend's mom will be 92 the 28th. The bottle with the rosary would be an awesome gift for her! Been watching your blog for a while and started following via email a few days ago. Beautiful stuff! Would love to win. The rosary and bottle would be lovely to hold my holy water. Thanks. Also tweeted your contest. thanks. 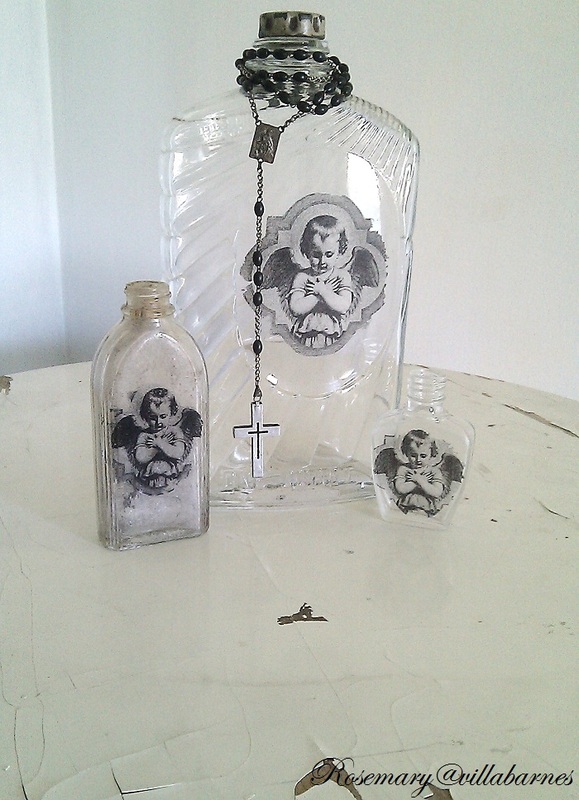 I've purchased several items from your Etsy shop including chandy crystals, an altered bottle, parts from an old frame. I've loved everything that I've purchased! I already follow (and adore) your blog. I have been a gfollower of yours for some time now. Thanks for the chance to enter your giveaway. Please enter me in your giveaway. I am a Follower via email. 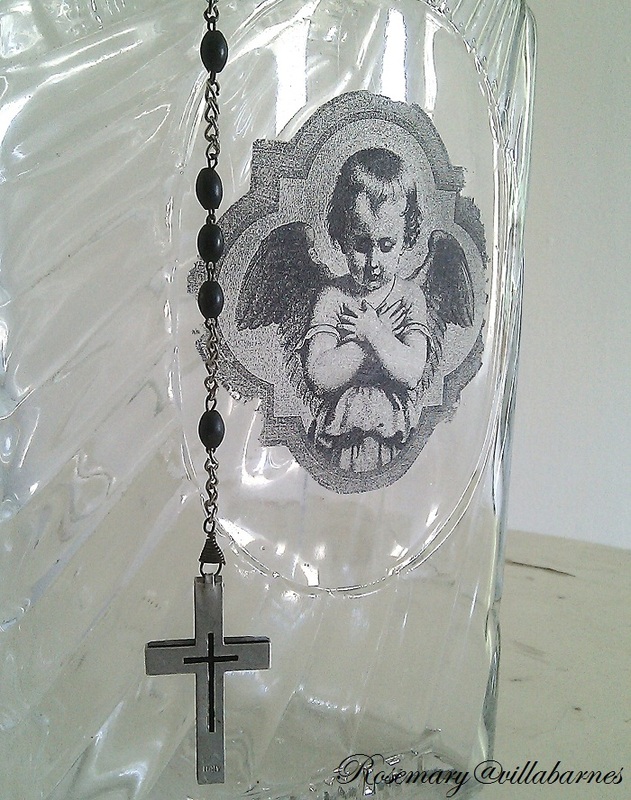 The bottle with the rosary hanging is especially pretty! I'm now following you on Linky! Hi Rosemary! I'm already a follower of your wonderful blog! Hi again! I also follow through Linky and would love to be entered in this give-away - gorgeous! Girl, of course I'm already a follower! I would love to have you enter me in the contest! Thanks!! And I am now also a follower on Linky Followers! And I shared the contest on my Facebook page!! I have posted about your give-away on my blog! I have posted about your give-away on my Face Book page! I have tweeted about your give-away on Twitter! Bonsoir! I am your newest follower. Would be thrilled to win this beautiful and generous giveaway. Merci for the chance! What a lovely giveaway Rosemary! I'm a happy follower!! Lovely Rosemary, I would love to win this. Hi there - just found your blog, and am now a follower of your blog and a Linky follower. I love your ideas, and will certainly check out your Etsy shop. Keep up the great work. Anyone would be fortunate to receive these beauties. Count me in for the drawing! I follow you through linky followers and blogger. And on FB, too! I'll jump right over there to share that post. Thanks, Rosemary! Charming gifts Rosemary. I follow of course. I Checked and I already follow you on Linky. 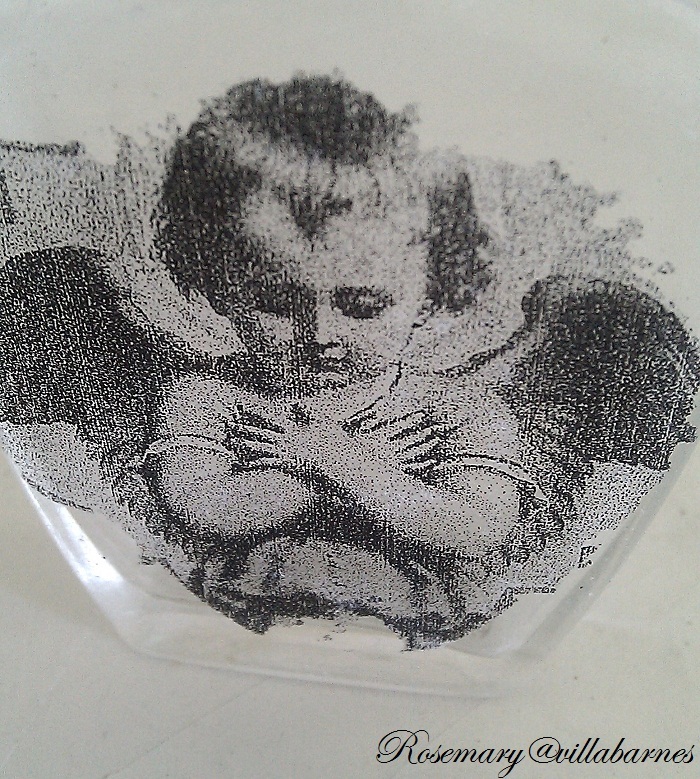 I have always loved angels and would love to add these to my collection! I follow you via Linky! I'm a happy follower. I'd love to win!!! Lovely wings!! I'm making some right away. Hello, I am a fellow follower and would love to be included in your heavenly giveaway! I am a follower and would love to win. Just lost my sister (that's why I've been absent a few days) and these would so remind me of her when looking at them. I have also purchased some of your aged vintage bottles on etsy. Hi, I am now a follower of your beautiful blog! Thank you so much for sharing your tutorials. I just love them!! I'm already a happy follower and would be so thrilled to win. I have my bedroom decorated with romantic things and your beautiful creations would be perfect for my dresser! Thank you dear one! Hugs! Started following you. Enjoy your blog so much. Following via email. Love the bottles. Linky follower. Enjoy your blog so much. Shared on facebook. You are so creative. Hi Rosemary These are the angel bottles I always bug you about when I see you at the flea market or shows!!!! So of course I would love to win these!!! OMG!!! How exciting. Thanks for the chance. I am a follower both on line and in person!!!!! I am a follower. 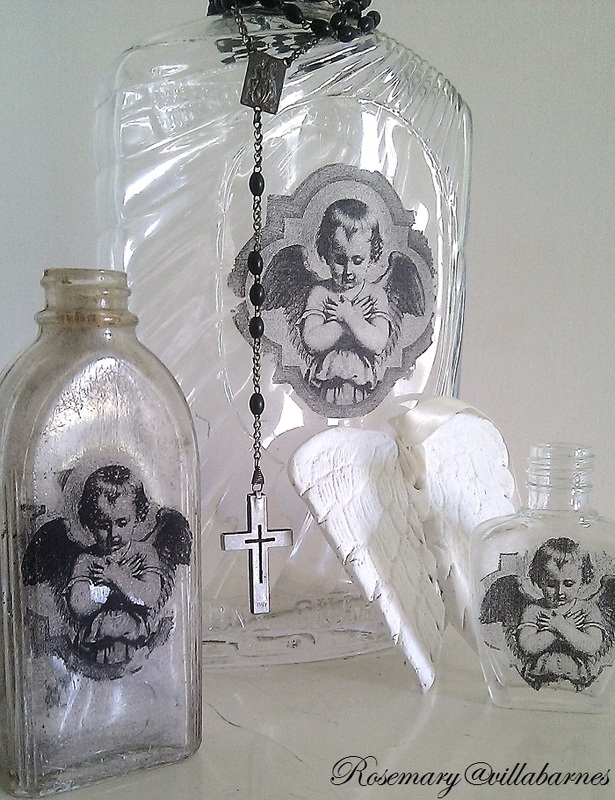 I love these angel bottles and the wings!! !